Journal of the American Geriatrics Society has a paper hinting at the prognostic significance of a functional decline associated with acute illness and hospitalization in older patients. The data come from a prospective study of ~2300 hospitalized (non-ICU) older patients (mean age ~80 years) at two hospitals in Ohio in which patients' abilities to perform activities of daily living (ADLs) independently were assessed at the time of hospital discharge as well as two weeks prior to hospitalization. Vital and functional status were assessed regularly up to a year after discharge, allowing the researchers to compare survival in patients who 'lost function' during an acute hospitalization with those who didn't. Patients discharge with at least one new ADL disability were older and sicker: had longer hospital stays (8 vs 5 days), more likely to have pre-existing functional impairments at baseline or live in a nursing home, and more likely to have dementia and COPD than those discharged without new disabilities. Not surprisingly the '-ADL' group did much worse: had a ~40% 1 year mortality vs 18% for the stable ADL group. In addition, in looking at how patients do at 1, 3, 6, and 12 months post discharge what seems to happen is that about 1/3 of the -ADL group recovers to baseline in a month. This ~1/3 of patients who return to baseline remains relatively constant for the rest of the year (about 1/3 of the -ADL patient group were at their baseline status at 12 months): the remaining 2/3 either has died or has persistent disabilities at 12 month. The researchers noted that not returning to baseline at 1 month was a bad prognostic indicator for the -ADL group and described the natural history of those patients: only 17% went on to recover baseline function by the end of the year, 44% had died, and 38% had persistent deficits. While most patients' courses seemed to be 'set' at one month there were certainly patients whose status/courses changed after a month as well: of those who recovered to baseline at the end of the year 38% achieved that after one month, 20% of patients who did recover by one month had died by 1 year, etc. Nevertheless the general trends are what are important: loss of function is associated with poor one year survival (40% mortality is worse than the mortality for newly diagnosed metastatic breast cancer in an 80 year old), and the one-month recovery mark seems to have some predictive power as well. The paper's discussion talks mostly about the need for aggressive rehabilitation in these patients, which one can't argue with, but also begs the question of what is causing what? Are the worse outcomes here due to 'inadequate treatment' (in which case patients would indeed benefit from more aggressive/long-lasting rehab) or is loss of function/failure to regain function within a month more of a marker of illness/frailty/something else underlying the poorer prognosis which won't necessarily improve with rehab? Annals of Internal Medicine recently published a fantastic personal reflection piece about dying, uncertainty, and communication in the ICU. It's one of those essays you read and say to yourself, 'Yes, yes, yes - that's exactly what it's like.' I don't agree with everything the writer (an ICU doc) says, but how he describes the chaos of decision-making, prognostication, suffering, grief, and hope is very familiar and true-to-life. At first I thought that I had a talent for these discussions, that they were something others avoided that I could do. But that isn't quite right. In fact, these are opportunities for performance, and I seek them out like strong coffee or difficult procedures. I like to talk to people who are reforming their lives in front of my eyes, who need certain bits of information to piece together sense from chaos. I'm not empathetic—I don't suffer with them, but I watch closely, looking for clues to what they need, doling out the little packets of information that they can use to build a framework of understanding of the future. As in poetry, an economy of information is key, and you can't rush delivery. Uniformly, these people want the return of what's been lost, as it was before. Occasionally we deliver. But more often we are talking about wreckage, about what's left, and what, if anything, might be possible. What's said is rarely what's heard. Although the delivery and message don't change too much, sometimes I'm thanked for the straight story, other times for giving hope, and then sometimes I'm chastised by an angry family who feels somehow robbed or betrayed. They fasten onto a look or a word, onto the tone of voice, or pace of speech. I have a few solid things to tell these people: I can tell them what happened, and sometimes why it did. I introduce them to the doctors and nurses and therapists they will see every day. And then I do my thing. I sell them smoke and shadows, clouds passing in the dark, the whole manuscript of uncertainty, as delicately and proudly as I can, because it's the only truth I have. Thanks to Dr. Sean Marks for sharing this with me. JAMA has a paper looking at patterns of opioid abuse/use amongst people who died of unintentional drug overdoses in West Virginia. The vast majority of deaths involved prescription drugs (mostly opioids), multiple drugs ingested at once, and most involved either diverted drugs or patients who acquired their drugs via 'doctor shopping.' Methadone was disproportionately represented compared to other opioids (for unclear reasons). It's a sobering view of the prescription drug abuse epidemic in the US. An accompanying editorial provides a reasonable gloss on the data, and tries to contextualize it in physician behavior (ie - what should we be doing about this?). It leads off early asking if it's time to restrict the use of opioids for chronic pain, only to say no (thankfully) and to give a lot of good reasons why: there are no data in this study suggesting this was from 'iatrogenic addiction' (patients became addicted after receiving prescriptions of opioids for pain), plenty that hefty amounts of diversion are involved, and there's still no clarity on what fraction of diverted meds actually come from physician prescribing (may instead be prescription forgery, pharmacy/supply-chain burglary, etc.). They make some generic and uncontroversial recommendations: ask patients about any abuse history, use urine toxicology screens and opioid contracts. The nomination period closes Wednesday December 31st with polls open in mid January. If you need some hints about other great hospice & palliative medicine blogs to nominate feel free to check our links in the right hand column. The list of nominee's is an excellent view of the scope of medical blogs if you wanted to get a taste of what else is out there. Everybody loves lists right? Especially at the end of the year, so I present you with the first annual(?) Pallimed End of Year Lists. To have more time to read more articles so I can then blog about said articles. To have more journals moving towards an open access model. To have more journals including a DOI identifier on every article. To know someone generous in time and spirit who would want to help make one minute animations in Flash for educational issues in hospice and palliative medicine. To have someone give Drew a grant to found the Institute for Academic Blogging. To possess a machine to translate my thoughts into blog psots wihtout any mispselligns. To have more palliative medicine blogs to read. To have one hospital put up a billboard highlighting their spectacular palliative care team, instead of the oncologists, cardiologists or orthopedists. I would blog about that forever! For a major magazine to do a cover feature on palliative care. Top 10 Pallimed (Main) Posts for 2008 - in case you missed them the first time around. 9. Medicare Hospice Cuts - Is Hospice Worth Protecting? After the first of the year, when Drew and I get a chance to analyze some other stats from the Pallimed blogs, we hope to share some of them with you. Thanks to Drew and Thomas for the great year on the main blog, and to Amy and Amber on the Arts & Humanities blog. (Fantastic by the way, you should really check it out.) Thanks to all of our new subscribers who have made this site bloom beyond our expectations. Thank you to all of our readers quiet and loud. Keep the feedback, tips on interesting articles, and comments coming. And thanks to my wife Kelly for listening to me talk about the new comment someone just posted on the blog, and for letting me type posts late into the night. I am signing off Pallimed until the New Year. Have a safe and happy holidays! While this may be old news to some, I wanted to (re-)encourage you to visit the excellent 5-part piece on palliative care by the Dallas Morning News. Besides being a very good piece of narrative driven medical journalism, the articles, videos, and photos serve as an excellent example of how palliative care collaborating with local media establishes a broad public understanding. Imagine if a 5-day series like this was repeated in local media outlets (the type of media does not necessarily matter: TV, Radio, Newspaper) across the country and even the world. So a good New Year's Resolution for your palliative care or hospice team might be to engage local reporters to do a similar story to the Dallas Morning News. The Sacramento Bee won a Pulitzer Prize for a photojournalism story covering pediatric hospice in 2007. A classic case of Win-Win-Win. Rise in public awareness about palliative care, promotion of local palliative care efforts, recognition for excellence in local reporting for the media. The Hospice Foundation of America blog tends to highlight local coverage of hospice & palliative care more than Pallimed, so follow them for a taste of what other news organizations are doing. The stories were written after having the reporter and a photographer/video journalist follow the Baylor Palliative Care Team for 3 weeks around the clock along with some other extensive periods over several months. A nice addition is the reflective essay by the photographer about being so close to these patients and families during intensely personal moments. There are some other gems I will leave for you to discover. Another interesting part of the piece is a 4-person round table discussion about the current and future of palliative care. There are many interesting pieces to dissect in that section which I hope to explore in some detail in the new year. Journal of Clinical Oncology has a paper looking at the changes in the quantity and quality of palliative care and hospice research over the last 100 years. Indeed. The paper looks at the quantity and type of palliative care articles indexed by Medline, comparing those published before 1970 with each 5 year period after 1970 through to 2005 . They essentially looked for papers with the terms 'palliative,' 'hospice,' or 'terminal care' in their citation (they allowed for truncated/variable versions of those terms, and used an all fields search meaning title, abstract, and subject headings were all included). What they found was that yes, palliative care publications have increased greatly in number, as well as percent of total publications, over the last few years: for instance in raw numbers there were ~4000 papers which met their search criteria at 1975, ~28000 at 1995, ~41,000 at 2000, and ~57,000 at 2005. To clarify this: 57000 total articles were found in the database in 2005 - this is a total/cumulative number not ones added in that period - but one can assume that well over 10,000 articles were published between 2000 and 2005 which met the search criteria. Medline does 'back-tag' articles with newly developed subject headings, and so some of the increase between 2000 and 2005 is due to older articles being newly tagged as 'palliative' ones, but likely the vast majority of that increase represents freshly published papers. In addition, they found the fraction of published papers which met their criteria increased over that time period ('palliaitve' articles rose from .08% to .38% of all the total Medline database), that the fraction of 'palliative' papers which represented original research rose dramatically (.96% to 7.2%) and that this increase outpaced the increase for medicine (Medline) overall (.45% to 5%). They give some interesting data about where all these articles are being published - a lot of different journals of course - but you can look at where most were. A few things here. First, looking at the journal list, while there are many that are obvious (JPSM, JCO, JPM, etc.) there are some which aren't, including Gastrointestinal Endoscopy, which highlights the problem with looking at publications this way - the word 'palliative' is used widely particularly in surgical and 'proceduralist' journals in a specific way which is accurate to be sure (basically means non-curative as in a 'palliative gastrojejunostomy' etc.) but doesn't necessarily make it palliative care-relevant (at least to me and people I know who practice it). This is a real-life issue for me because one of the many ways I screen articles for the blog is by using a filtered Medline search which includes everything labeled with a 'palliative care' label/subject heading (along with a whole bunch else). This means my inbox is flooded with technical research about pediatric cardiac surgery (many 'palliative' procedures there), as well as a good amount of endoscopy research, all of it 'palliative' but little of 'drew-palliative.' Actually, my search strategies are completely based on ones the group who published this paper have developed over the years (check out their website) - they are quite good, and suit the function of screening for the blog very well. Then there's the reality that much (most? nearly half?) of research which is relevant to my day-to-day practice isn't caught by a strategy using 'palliative care,' 'hospice,' 'terminal care' etc. subject headings. E.g. pain trials which aren't specifically in a palliative care setting but still would inform my practice, papers about prognosis in brain injuries, etc. 'Palliative care relevant' but not 'palliative care specific' research. Given that, there's every reason to believe then that the fraction of palliative care-relevant research is even higher. Does the exact percentage, or how we do '% clinical research-wise' make any difference? Not at all of course, but the point of the article is well-taken and almost certainly valid: palliative care publications and research are growing rapidly, and we do pretty well research-wise compared to medicine as a whole. Given that this is a big part of my life (on the blog) it kind of gets me going. The challenge raised by these findings is that clinicians providing hospice or palliative care as part of their practice have no simple way of identifying the evolving evidence base. Effective retrieval would require a comprehensive strategy actively searching general and specialist clinical and research literature. The challenge of not having one set of subspecialist journals on which to rely is magnified given a rate of growth for palliative care clinical trials of 1.4 times the general clinical trials literature over the last 35 years. I think this is a major problem. It's not unique to palliative care, although it might be accentuated in our community. It's tough to actually find our research base, and you can't rely on a few major journals. I'm curious as to whether this will change over the next few years - if the research will consolidate so it'll be easier to find. Probably not, however, given that many of these issues are critically important to other specialist communities (critical care, oncology, trauma surgery, nephrology, etc. etc.) and so will remain sprinkled among dozens of subspecialty journals. Cancer recently had a review about communicating about cancer near the end of life. It's one of the best literature reviews of the topic I've read in a while, summarizes the literature, describes the knowledge gap we have, but also the practice gap between what we know about what patients want regarding communication and what actually happens. A great one for the teaching file: I've already been handing this out. A couple from a recent NEJM which may be of interest to palliative clinicians.... First is a practical review on levodopa for Parkinson's disease - discusses history, evidence, and practical matters. I found it to be a helpful refresher. There's also a 'journalistic' piece about newly developed programs for primary care (NP, doc, etc.) home-visits for home bound/disabled patients (free full-text). Apparently there have been mixed results regarding health-care costs. A couple from Journal of Clinical Oncology.... One is a review on non-pharmacologic techniques of managing chemotherapy side effects. Specifically, self-care/self-management strategies that patients themselves can do. Typical systematic review of symptom research findings: not too many good quality trials; heterogeneous patient populations, interventions, and measurements; urgent calls for more research. Nausea and vomiting were the most studied with distraction, desensitization, self-hypnosis, exercise, music therapy, and relaxation having decent supporting evidence. The other paper explores potential quality-of-end-of-life-care markers in older cancer patients. It looks at administrative database data for different populations, looking at opioid prescriptions as a potential marker of quality. Basically they found that there were certain predictors of opioid prescriptions in these cancer patients (teaching hospital, exposure to a medical oncologist). There were other similar findings - access/use of hospice varying by where you get your care, etc. I can't say that I read this and was convinced opioid use is a helpful quality marker, although it shows some promise, and is a potentially easily measurable one. What is striking is, again, the variations in care across the populations studied and how where you get care and by whom really has an impact of what sort of care you'll get - even basic/fundamental things like hospice utilization before you die. This is a quality problem. JAMA has a systematic review of treatments for pressure ulcers. 'Little evidence' for pretty much everything. A good literature review of the topic though. Palliative Care Nurse: Hey Dr. Palliativist, we got a new consult, Mr. John Q. Moneybags, the famous billionaire in our fair city. Our CEO knows how much palliative care consults can really make the patient feel valued so he wants us to go see him. Dr. Palliativist: Hmmm...not good...he's in the ICU, and it looks like he has been diagnosed with the fatal Moon Virus, discovered just this week in late December 2009. Palliative Care Social Worker: Hey I heard about that fatal moon virus. I think they are going to have a cure....but not until January 1, 2011. I wonder how Mr. Moneybags might feel about his health care advanced directives? a)"An endotracheal tube doesn't scare me. Bring it on!" b)"I fear being kept alive on machines and the horrible effects of that nasty Moon Virus of 2009. Please let me go gently into the good night." c)"Please keep me alive until we get into 2010 so I can give more money to my children!" d)"Please keep me alive until we get into 2010 so I can give more money to your wonderful hospital!" Well, thanks to a concise article by Dr. Mendenhall in the December Annals of Internal Medicine, we all have a good primer on the chances you may get this consult. The year 2010 will see the extinguishing of the Estate tax, pejoratively known as the 'death' tax. So in 2009, a dying millionaire would pay nearly $3mil in taxes on $10mil of assets. In 2010, that millionaire would pay ZERO. And in 2011 that same millionaire would pay nearly $5mil in taxes. I hope you did not get whiplash. Now technically the Estate tax only affects those with over $1mil in net assets in 2011 and over $3.5mil in 2009 so it is not your everyday patient in the hospital for sure. But if the news over reports this and it gets featured on the front page of the WSJ, then you might get more people thinking it affects them. So the $3.5mil dollar question is: Does it matter if a patient includes the distribution of one's finances into health care decision making, particularly when it comes to choosing OR refusing potentially life-sustaining treatments? Dr. Mendenhall writes that awareness of this information can "...affect the ability of all involved parties to make unbiased decisions." Besides making the case for the non-existence of unbiased decisions, I think the inclusion of financial matters is a valid fulcrum for health care decision making. In a whole-person approach, the financial stability and security of one's assets may be a demonstration of love, good parenting, thrift, rebellion against taxes, or many other things representing high personal value to a patient and therefore part of the patient's image to one's family and peers. Would it 'feel yucky' to be part of a medical team advocating for health care decisions based on a patient's thoughts about their finances. Yes. Is there room for abuse of power in this situation? Absolutely. Does that invalidate the reasoning of the patient? No. And by extension is does not necessarily invalidate the reasoning of the surrogate, but I think investigating surrogate reasoning would be appropriate if sufficient cause exists. It is part of the medical communities role to help avoid abuse in this type of decision making when finances may be an influence and this article is a good quick step to understanding the potential impact. e) Dr. Sinclair saves the billionaire from the fatal Moon Virus of 2009 with a single dose of morphine! Mr. Moneybags is so grateful he open up the Mr. Moneybags Institute for Palliative Studies That Sometimes Cure with Dr. Sinclair as the CEO! Bonus: Great interactive page on where your taxes go. Did you know the National Cancer Institute ($4.8B) gets more Federal funds then the FDA ($1.7B)? Cancer has a study looking at cancer patients' preferences for quality vs. quantity of life. These data (which come from a larger, ongoing controlled trial involving a decision-making support intervention) come from ~450 patients with metastatic cancer (unfortunately not a very representative population: median age 60 years, 91% white, 70% with some college education) and were gathered at the time of their initial visit with a medical oncologist. They were asked how they value quality of life vs. length of life (e.g. QOL is all that matters, QOL is more important but LOL matters, LOL is more important but QOL matters, LOL is all that matters). Findings were relatively straight forward: most patients viewed QOL as more important than LOL (15% said only QOL was important, 65% said more so), with older, more educated, and white patients trending more towards QOL than others. What they then did was (after adjusting for baseline characteristics) look at how QOL vs. LOL related to psychologic factors and patients' stated preferences for physician communication style. Patients who rated QOL as most important reported significantly less psychological distress (as measured by the Impact of Events Scale - a PTSD screening tool) than those who ranked LOL as most important. Additionally, the 'LOL+' patients were more likely to say they wanted their physicians to speak more positively, to soften bad news, and to speak generally rather than specifically. These were modest, but statistically significant differences. This is additional research fleshing out what has been observed clinically for a long time: fear and distress drive decision making, readiness-for-frank-communication, etc. This reminds me, to an extent, of some of the Coping With Cancer Study findings - knowledge (or at least acknowledment) of having a terminal illness was not associated with increased rates of 'bad' psychologic outcomes - however of those who had a lot of fear/terror, those who acknowledged being terminally ill were worse off than those who didn't (rates were the same, magnitude was worse in those who 'knew'). The big question, clinically, is what can we do about this to prevent it or alter it - i.e. to nurse those patients who are afraid, clinging to 'LOL' to a place which is more like most of their neighbors who for whatever reason are quite different - not as afraid, able to contemplate alternatives? Part of this is can we do anything or are these relatively deeply ingrained personality/coping styles which aren't and shouldn't be changeable? For me this is both a therapeutic question (can we even do this?) as well as a moral one. Should we be trying to do this? Is peacefully accepting your mortality a good thing - a morally superior outcome? I think it is for me, and there's evidence that acceptance of your death improves your quality of life as you die - and certainly helps your bereaved relatives (check Coping With Cancer again). But some people don't want to go gently into that good night, and as I sit there with these patients, suffering, frightened, mad as hell about what's going on, clinging to any sort of hope that the inevitable isn't inevitable, who aren't interesting in walking through any of the doors I open for them (i.e. treatment plans designed to ensure they don't die on the side of the highway as they make a final run for their 4th 2nd opinion) - you have to acknowledge to yourself that perhaps dying trying for these patients is, in fact, dying well. Journal of Clincial Oncology has a paper discussing the development of a survival-prediction model for cancer patients. The paper actually looks at the development and validation of two models (based on the same data sets). The data mostly come from Canadian patients referred to a radiotherapy center for palliative radiotherapy (this is a large, prospectively gathered data set which includes cancer type, performance status, types of metastases, etc.). One of the models used a point system (based on type of cancer, performance status, and presence of non-bone metastases), the other model was a simple 1, 2, 3 stratification of patients based on if they had 1, 2, or 3 poor prognostic risk factors: cancer other than breast, Karnofsky score less than or equal to 60 or ECOG greater than or equal to 2, and non-bone metastases. Those who had all 3 risk factors had a median survial of 9 weeks, with 3, 6, and 12 month survival of 35-45%, 14-27%, and 3-11% respectively (the range there is due to differences between the derivation and validation sets). Those with 2 risk factors had a median survival ~25 weeks with the 3/6/12 spread of 68-76%/45-52%/23-26%. There's a lot of extra data here - comparing the two scoring systems with each other and a previous one, etc: they all ended up having similar prognostic power. They don't give enough information in the paper to determine how this would match up to simple time prediction based on one factor (ie performance status), nor is one ever certain how to generalize these sorts of data, particularly as this is based on patient characteristics at the time of referral for palliative radiotherapy. That said, in total over 1000 patients were included in the analyses in this paper, which is a lot for this type of research, and it probably is as good of a representative sample as anything out there. What is particularly helpful clinically, at least for me, is that it presents both median survival data, as well as, e.g., 6 month survival - getting a sense of that spread is always welcomed. Cochrane has published a meta-analysis on exercise for cancer-related fatigue in adults. Unlike our previous complaints about Cochrane reviews this one had a good number of trials (28, with 2000 patients), but like my most recent griping includes an astonishing variety of patients and treatments (graded exercise training, tai chi, yoga, home-based and supervised aerobic exercise programs, strenghtening programs; patients range from youngish breast cancer patients having received curative therapy to stem-cell transplant patients to a variety of 'stage IV' patients). Of course there's also the variety of fatigue measures used.... I'm going to leave all that behind however. The authors conclude that the evidence supports exercise for cancer-related fatigue (which is fair, and if you look at the forest-plots in the review the vast majority of trials tilted towards there being a positive treatment effect). However most of the patients had breast cancer, and while it's impossible to tell, one suspects a large number of these were receiving/had received curative therapy (e.g. surgery plus adjuvant chemo/radiation). That is, these findings don't apply to patients frequently encountered in 'palliative care' settings, which makes me wonder - what do readers recommend regarding exercise for advanced cancer patients with moderate to severe fatigue? I personally don't actively recommend it, outside of general advice to keep active as much as people feel able without over-doing it (vague I know - I usually recommend walking). I know this is a controversial area (largely because there's a void of studied, successful interventions) - what do others say? Should I be doing better? Science Commons Impacting Palliative Care? Palliative care folks tend to be a sharing bunch of people when it comes to professional issues. Willing to share stories of difficult symptom control issues, or communication challenges. Willing to share their knowledge of palliative medicine to help other health care professionals provide better end-of-life care. Willing to cross boundaries amongst rival local medical systems to provide support to each other. When it comes to research I think we operate in silos, and the ability to share research data impedes the progress we need to achieve. Think of all the hospices and palliative care teams who have access to some great clinical data, but lack the ability to share and collaborate easily. Our field already has a few intrepid people encouraging collaboration. The Center to Advanced Palliative Care represents hospital based palliative care teams. The National Palliative Care Research Center is a one-stop shop for beginning palliative care research, but does not focus on networking. The Population-based Palliative Care Research Network (PoPCRN) was one of the earliest collaborative efforts but seems to have gone quiet recently. Establishing a research infrastructure, integrating it into regular clinical care data, and developing a network to collaborate would be an important step forward to improving end of life care. I am hoping with Sean Morrison as the President-Elect for the Academy we may see some progress in these areas. A DC court has dismissed the National Hospice & Palliative Care Organization's legal injunction against the implementation of the CMS Hospice Wage Index cuts. HospiceGuy @ HospiceBlog and the Hospice Foundation of America blog had already posted this last week. The NHPCO web site has a lot more detailed information regarding their efforts to delay and possibly repeal the cuts. I give them kudos for the advocacy efforts and for providing so much information on their web site. Well, I am exhausted posting about this topic since the Washington State voter referendum, and I took a personal vow to take a break from posting about hastened death lest I be stereotyped. But this is a slightly different twist that our field need to be aware of and maybe start having some more discussions at the regional and maybe national organization level. A Montana Judge ruled that a terminally ill man has the right to obtain and take pills to hasten his death if he feels the suffering is unbearable. The patient/plantiff is supported by Compassion & Choices (previously known as the Hemlock Society). The court decision is well written (regardless of which side you are on) and despite a little legal-ese reads as a pretty good ethics and law history review regarding hastened death. The big issue hinges on autonomy and the right to privacy in a doctor-patient relationship as well as a state's role in directing medical services within the state. Medical Futility posts about it here. WSJ Health Blog here. Local Paper Angle here. As always read the comments for some public insight. Dethmama is back with one of her time of death posts. You can find beauty in death. She also has another post that many hospice staff have probably experienced. It has a classic tag line: "Watching him (the doctor) leave, I raise my voice, "Why did you order Dilaudid if you weren't going to use it for her pain?" Dr. RW likes the effectiveness and efficiency of palliative care and had read Dr. Wachter's post, but still questions why anyone would really need a palliative care team. He asks shouldn't all doctors strive to do what palliativists do? Professor Pope at his blog Medical Futility posts an exchange between a physician and himself regarding unilateral decision making in a futility case with a surrogate decision maker who refused PEG placement and DNAR (DNR) orders despite multiple family meetings. Read the back and forth exchange and try and guess the ending. Fatigue, the forgotten symptom. Risaden brings it to life in her post on her blog Risa's Pieces. Ever notice how different ICU's (trauma, surgery, medical, bone marrow, neontal) have different cultures regarding resuscitation attempts? Leo Levy at DNR/DNI discusses some of the differences. Tim Cousounis at Palliative Care Success postulates that health care reform may not be a good thing for palliative care. Leave him your thoughts and stay tuned as he plans to tell us why he thinks that with future posts. Insure Blog highlights Tom Daschle's challenge as the new director of Health and Human Services in the Obama Administration. The main point - rationing and end of life care. Is palliative medicine as a field prepared for this amount of attention, and not all of it good if we are perceived as the consolation prize for 'rationed' care. WSJ Health blog notes the increase use of balance billing by physician groups to recoup costs not covered by insurance companies. I am not aware of any palliative medicine doctors who do this given the usual background in hospice and dedication to provide care regardless of ability to pay. But it does bring up the question if families and patients would balk at balance billing by pallaitive medicine consultations. Would they consider the 2 hour family meeting worth the amount billed? Have any readers (patients or physicians) had a dilemma with this? Hospice Guy posted about how one for-profit hospice closed in early November. Apparently not too gracefully judging by the comments. Are there more hospices that may be on the verge of closing? Is hospice recession proof? Maybe that is a future post! The Frontal Cortex blog addresses hallucinations of deceased people by the bereaved in the weeks after the death. Is it a hallucination or is it real? Poll hospice & palliative care people and your results may vary. On his blog Running a Hospital, Paul Levy, CEO of Beth-Israel Deaconess Med Center highlighted end-of-life care as noted in the recent Wachter post as well as an article from one of his own physicians about how to honor the patients who have died. Thank you very much to all the AAHPM members who voted for the current slate of AAHPM board of directors. I am very honored to be one of those directors at large. There are two things that excite most about being able to serve in this position. The first one is the culmination of a goal set out by the palliative medicine fellows of 2003-4 and the other founders of the Professionals-in-Training Special Interest Group. In our first meetings, we discussed ways for fellows to get more representation in the Academy, and getting a recent fellow onto the board was one of the early suggestions. As far as I know Solomon Liao is the first AAHPM Board Member who completed a palliative medicine fellowship. He has been a strong advocate for fellows and was a key figure in broadening the number of case conferences for trainees at the Annual Assembly. He was elected in 2008, and now with two board members who have been through a palliative medicine fellowship I hope the needs of the fellows and junior members of the Academy will be well represented. The second exciting opportunity is the intersection between this blog and my role as a board member. As always the board members' emails have been available to Academy members so that you could contact them with your concerns, questions, etc. But with Pallimed the level of interaction that Pallimed readers (AAHPM members and non-AAHPM members) have with the AAHPM board is that much more accessable. Now I will have to discuss with Drew and the AAHPM regarding what I can report on and what I cannot/should not discuss here, but maybe with a little glimpse into the workings of the board, you may have a bigger say in things. Thanks to Drew for creating Pallimed and allowing me to be a part of it. Without this opportunity I would not have had the opportunity to be on the Board. Thanks to my cohort of fellows from 2003-4 for their advocacy and support for all fellows in future years. 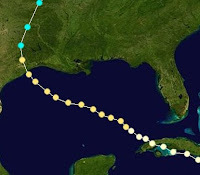 It was only 3 short months ago that Hurricane Ike devastated the Texas Gulf coastline creating havoc in the Galveston and Houston areas. I had a chance to share some emails with Deborah Perryman, LMSW (Executive Director) and Beverly McCormick, RN, BSN, CHPN, (Community Outreach Education Liaison/Admission Nurse) with Hospice Care Team, a not-for profit hospice that serves the areas hit by Hurricane Ike. Here are some of the excerpts from those emails demonstrating some of the adverse conditions during and after the hurricane. 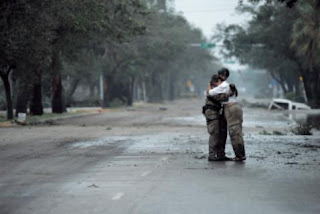 For another Pallimed post on natural disasters and hospice check out the post on the Iowa Floods. How do you deal with your own needs and losses along with our patients? McCormick: We have offered each other lots of support, designated a special room where anyone could meet with bereavement person or SW or each other. We've cried a lot at different times, we try to help each other as needed. Now further out, our executive director encouraged trying to take time for ourselves and have fun. We even planned some events just for staff. We are all clear with boundaries, we do not share our losses with our patients, they have enough to deal with. We can support each other, and can make general comments but focus on patients and families at this trying time. ( That is as always ). Since many patient couldn't return, our census was greatly impacted which affected staffing, and sadly we had to make some layoffs. Perryman: It was hard dealing with my own needs and loses because there were so many people hurting. I changed the route coming to the office because the National Guard and Disaster Relief groups made me cry. When we found real food, lunch was provided to the staff which consisted of chili, hot dogs and chips. What a feast! The staff cheered when we received mail for the first time after the hurricane. When the office reopened, there was no power but we decided to meet anyway as patients/families were calling with needs. About 15 minutes after our chaplain prayed, the lights came on. Boy did we cheer then. Driving around town everyday brought new challenges and new waves of emotions. That was certainly a life altering experience. The staff met every morning to share information ( where to get water, ice, food; stores opened; where to get gas, etc), hugs, tears and accounting for patients/families. Staff was encouraged to take time for themselves. I was finally sent home on Thursday after exhaustion took over. The staff at HCT is awesome and handled the Hurricane like the professionals that they are. Kudos to the staff!!!!! Can you share some challenging events your hospice staff have encountered? Perryman: One of the biggest challenges was the cell phones. FEMA and others took over the cell towers prior to the storm on Friday and it was difficult to impossible to get cell phone coverage. My home land line remained intact throughout ALL of the storm and after the storm. One of the hospices in our alliance provided an emergency number just hours before Ike hit. It was a blessing as the patients, families, and staff could stay in touch. Between my home line and cell phone, we were able to remain in communication with everyone. to make a visit as the patient was transported home at the family's request to get him settled and order meds. McCormick: I talked with a patient from a trailer in the woods to try and get access to oxygen refills and refill medications just so he could return home. Nursing facilities were totally stretched going to places with halls for rooms and their sack of personal belongs, traveling with staff who had to leave their families etc. A church sent volunteers to help with care. One nursing home was so damaged, it is closing, the other doesn't want to reopen without UTMB hospital to send patients. So many people are so uprooted. Were your emergency /disaster plans helpful? Perryman: Yes. HCT practiced the emergency plan for Rita and it was okay. Since then there had been some drills and were able to work out a few hitches. 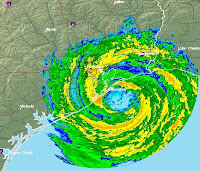 The biggest challenge with the emergency/disaster plan was that every time we began a phase of the plan, the path of Hurricane Ike came closer and closer to Galveston County. It was a challenge staying one step ahead of the storm! Thankfully, all of our patients were accounted for and provisions made to meeting their needs. McCormick: We do have a good emergency plan in place and it worked. We triage our patients on admit and weekly; they have hurricane info in their patient handbook. We send two weeks meds, supplies, obtain oxygen and give names of hospices in locations they evacuate to. Any particularly difficult clinical situations that you would care to share? McCormick: I admitted a patient the Thursday after the hurricane and their friends graciously took in three families on evacuation including this dying patient who in fact died only a few days later. I readmitted a patient last week who had been followed at home by Houston hospice, now living in a rented condo in Galveston. Her husband was home trying to save belongings before their house was cut down as most are up to four feet through the sheet rock down to wood. He lost most of his belongings plus knowing he'll lose his wife of 50 years soon as well. Fortunately they are blessed with adult children who help. I went to admit a patient and it was almost impossible to get into the house. There was a chair at the bottom of the front door to the trailer about 10 feet below, fortunately, there was a way to get in the back door, no AC, caregiver a young mother with an infant. Tough times. I met with a man at small community hospital who hadn't evacuated in Galveston, but got so sick with no power, water, etc, he had finally gone there (to the hospital). He wants to return to home, but has no caregiver and so we'll see what we can do. He said he had hoped to be washed out to sea with the Hurricane as his doctor told him he was a goner! (I doubt that, but that was his interpretation and why he accepted home hospice when discharged). Our chaplains and social workers are giving much support; and volunteers, if not affected, have been helping as well, one is giving out food from a church and offering support. We've all been working hard. Lots of things are hard as very few live in their homes. Perryman: The most difficult was trying to staff crisis care around curfews. We were very limited in mobility due to no power, NO GAS, damage in neighborhoods. Staff was able to meet everyone's needs by being creative and resourceful during and after the hurricane. HCT was able to keep a core team (RN, social worker, and chaplain) within miles of our service area. that was left behind. It was hard at times not to panic-- which is the right decision totally pack the office or leave it-- go or stay--and yet all of the choices made worked. We are very blessed and look forward to a break until next Hurricane Season. Thanks to Ms. Perryman and Ms. McCormick for sharing this helpful insight. If you are making any donations to hospices this year in your local area, you might consider giving to some of the hospices in the areas hit by Hurricane Ike. Dirty secrets, revealed only in letters? I wanted to highlight a couple letters to the editor recently about palliative care and patient survival. The letters are in recent Journal of the American Geriatrics Society (here with authors' reply here) and Journal of Palliative Medicine (here - you should be able to read the full text of this one freely online). The letters are from Drs. Andy Billings & Craig Blinderman from the Massachusetts General palliative care program & focus on a trial published in JAGS (here, and briefly blogged about here) last year of a home based palliative care program. I'm not going to argue the point about whether the survival difference should have been addressed more prominently in the article or not: it wasn't the focus of the trial, and there may (??) be statistical reasons to question if it was a real finding, and perhaps the authors didn't want to gnash their teeth about it. But that doesn't mean we can't or that it's not a topic worth discussing, because findings like this in some ways go to the heart of what we're doing in palliative care. I'm going to assume for this that, in fact, that outcome was valid: randomize a bunch of home-bound patients with poor prognoses to a palliative care service, meticulously discuss and document their treatment preferences, create a system which is more likely than it was prior to honor those preferences including ones for treatment limitations, and, yup, a sufficient number of those patients whose wish is to not go back to the hospital as long as they can be comfortable at home, or not go back on the vent, or whatever it is - a sufficient number of them get what they want - and die a couple months earlier than if no one had asked those questions/put that system of care in place - that this difference in mortality can be appreciated in a modestly sized trial. It is possible that the JAGS trial demonstrated just that. The question to ask ourselves, then, is Is it time to panic? I'd love to take a poll of readers (leave anonymous comments if you'd like) as to how many think that the above finding is 1) anything more than a little bit surprising, and 2) disturbing to them from a professional sense. My answers would be No and No. No to the second because I believe what I was taught and dutifully learned as a HPM fellow - in some cases goals determine prognosis. (Goals probably don't make much difference in advancing solid tumor malignancies, but for other diseases - dementia, COPD, CHF, etc. - people sometimes do get better with antibiotics, vents, etc. - if someone's survived the last 5 ICU stays there's no particular reason to think they're not going to survive the 6th - and if they make the decision for no more vents, antibiotics, ICUs, whatever then a good number of them will likely die a little earlier than otherwise - days, weeks, few months [but not likely longer than a few months for most patients with advanced illnesses]. Enough, though, that it could be measured in a trial....) Thus, sometimes the highest quality medical care, focusing on patient wishes and goals, will be life-shortening care. And that's an OK thing - in fact it's good as it's providing patients with the sorts of deaths they want - and these findings should be met with equanimity. The question, for me, is that just because we're all comfy with this, if subsequent trials/studies reproduce these findings are patients/families, other clinicians, and policy makers going to be groovy with this as well? And if we're in a position in which we're very solidly comfortable as a professional community with the whole quality>quantity balance in advanced illness and others aren't then, well, there may be some issues. This is what I'm gnashing my teeth about a little, and am young enough not to have much perspective on this, and am curious as to what people who've been doing this much longer than me think. There has been a push by some within our community to deliberately de-link palliative care with death/dying/end of life care/hospice etc. I don't deny this is the right thing to do (not to get us out of the care of the dying - which, I suspect, motivates most of us clinically - but to remove the barriers to palliative care for 'non-dying' patients with chronic illnesses etc.) - so what does it do to our message if it's shown that palliative care (even if it's high quality, patient-centered medical care, and even if it's only in certain populations like the homebound chronically ill) 'hastens' death? 'Hastens' seems so bloody wrong there, doesn't it? But in a medical (and research?) culture in which mortality and survival are the premiere outcomes of merit, and in which death is medicalized and not seen as natural or ok/right, if you give 50 people X and 50 people Usual Care and the X people die a little quicker then you've 'hastened death,' even if all you've done is allowed some patients to die in the manner of their choosing so to speak. I'm trying to think of what my patients would have to say about all of this, and I think most of them wouldn't have any problems with this: they get the whole quality>quantity thing (and, arguably, 'patients' have always been way ahead of the curve on this than docs have anyway....). I find that reassuring. However, there's a minority of my patients who would not 'get' or accept that, who are unwilling to contemplate any treatment limiting steps (outside of the period of imminent death where pretty much everyone says they want to 'be comfortable'), and for whom anything associating palliative care with treatment limitations or God forbid 'hastened death' would be a major barrier to them accepting our services. So-super-briefly you won't believe it. JAMA has a paper looking at some aspects of the 'natural history' of LVADs (see recent post). The paper adds some further detail to the review I blogged about before - complication rates, etc. One question it answered for me is that how many patients 'get off' LVAD therapy without heart transplantation (the answer is just a few percent at one year - the rest died or continued on the LVAD). Notably, this study confirms patients who receive LVADs after a cardiac surgery do a lot worse than those who don't (presumably these patients suffered major complications post-operatively). Annual cost ~$150,000. This is the future of medicine, unless our economy and health care system really does collapse this time, all of us in palliative care will be caring for more and more of patients before (hopefully) and after LVAD implantation. Tapendatol is a new oral analgesic just approved by the FDA for moderate to severe acute pain (Medscape article here - sorry you need a free log-on sometimes and I couldn't find a better freer source). Apparently both a mu-opioid receptor agonist, with some other properties like norepinephrine reuptake inhibition - smells somewhat tramadol-ish to me. Anyone know anything about this? Or of research in cancer pain populations? Archives has a paper looking at rate of GFR decline and mortality in older adults (only for the prognosis completists) as well as a prospective study looking at depression and antidepressant use in CHF patients suggesting that it's the depression itself and not antidepressant use which accounts for increased mortality. Hooray. The depression and physician assisted suicide fist-fight (which one could cartoonishly characterize as the depression-doesn't-matter-in-PAS vs. screen-'em-all-fools debate) continues in letters to the editor in BMJ recently. Letters here, here, and here; blog post about original article here. BMJ also has a letter arguing with the cancer pain guidelines I blogged about here: the letter makes a not-completely-crazy argument that buccal/transmucosal fentanyl should be considered the breakthrough med of choice at least for some types of 'breakthrough' pain. On Thanksgiving, Dr. Bob Wachter, Associate Chairman of Medicine at UCSF wrote a excellent post on his blog Wachter's World, praising the palliative care service. It has a wonderful double-take title: "My patient's are dying...And I've never been prouder." I don't need to make any comments except to say, "Thank you to Dr. Wachter for writing a excellent overview of why palliative care is so integral to good medical care." But in the hospital world, these twin trends – hospice on the one hand, and decision-making regarding CPR and mechanical ventilation on the other – remained strangely dissociated. The movement promoting compassionate care for dying patients was largely community-based and tended to focus on patients dying slow and painful deaths – mostly those with terminal cancer. Meanwhile, in the hospital we were exploring the senselessness of “doing everything” for (or, more to the point, to) patients with poor prognoses, troubled by seeing lives end so violently, stripped of all dignity. But we spent virtually no time thinking about how to bring hospice-like sensibilities and resources into the hospital. Frankly, as I think back, many of us saw that work as being a bit too touchy-feely for our tastes. We were doctors, after all, not social workers. But the larger tragedy of our failure to embrace palliative care as a legitimate discipline was that by continuing to view death as a failure, we failed to gain the expertise and garner the resources to promote affirmative conversations with patients about alternatives to aggressive care. Whenever I call the PCS to help care for one of my patients – as I’ve done several times this month – I am always awed by my colleagues’ skill and compassion, and the practical help they, the PCS-trained nurses, and PCS social worker Jane Hawgood, bring to bear at times of great need. And every time they are involved in a case, my medical students and residents, and the ones rotating on the PCS (which – as one small measure of the transformation – has become one of the most popular electives at UCSF) broaden their definition as to what it means to be a great doctor. At one point or another in virtually every case, family members hugged me, members of my team, or members of the PCS and thanked us for our wonderful care – this at the most horrible time in their lives. It is uniquely sobering and gratifying. This last point is the reason that I became aware of palliative care and looked into it as a field. Thanks again Dr. Wachter. Basically, oncologists rated themselves as good communicators (90% feeling patients always/usually satisfied with their communication), and 98% describe telling their terminally ill patients that they will die from their disease. They were more split about time disclosures: nearly half say that they give a time disclosure (prognosis) as a rule, the other half only do it if the patient says they want to know when the oncologist asks them (33%) or only if the patient initiates a request for the information (16%). 3 respondents said they don't talk time with patients no matter what (I'd like to meet these people, as well as the couple percent who don't tell their patients if their cancer is incurable - one wonders what they tell them about their intentions for giving chemotherapy and how they can give truly informed consent for such treatment if the patients don't even understand its expected outcome). My curiosity about these outliers aside, this represents a pretty dramatic generational shift in the last few decades in the US towards disclosure of prognosis aside. What was most interesting to me was the results of a multivariate analysis looking at predictors of physician self-reported willingness to disclose prognosis. Both advancing age and being Jewish were associated with a lower likelihood of disclosing prognosis to patients. Seeing lots of patients and reporting that you'd want to know your own prognosis were both associated with being more likely to disclose prognosis. While one can argue whether or not these individual 'risk factors' are relevant, the major point here is that as a cancer patient, what you are told about what to expect may in fact hinge not on what you want to know, or what you 'need to know' (we can debate what that actually is), but on simply who your oncologist is, and, for instance, what they would want to know if they were in your shoes. This is not good news. The authors also point out the elephant in the corner here: given the relatively 'strong' showing for physician disclosure of prognosis, how is it that numerous studies have shown a substantial minority of cancer patients don't seem to understand the most basic/essential information about their illnesses (e.g. whether the chemotherapy is being given with the intention/hope of cure or for non-curative so-called-palliative reasons). they are disclosing and how patients actually understand this information. Indeed. I've been contemplating this for a while in my own work, particularly with 'young oncologists' (fellows, etc.) struggling with difficult communication. Most of them are very comfortable with the idea that patients have a right to know their prognosis, should know it, etc., but I constantly see situations in which patients for whatever reason have not understood what the oncologist thought s/he was communicating. This 'skill,' - of gauging/checking your patients' understanding of things (particularly over time, after that initial first difficult disclosure, when all you've been talking about the last few months is the next scan or next treatment), seems like an important one, and one that is not talked about too often.